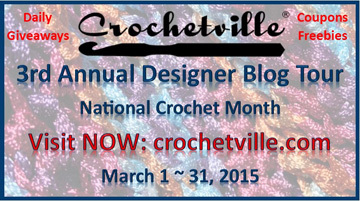 I’m thrilled to take part in the 3rd Annual Designer Blog Tour that Amy and Donna at Crochetville have put together. If you haven’t been keeping up with the blog tour that’s going on all of this month, you can read all about it and visit the many other designers’ blogs here. One of the things we do for National Crochet Month is have a special charity that we’re supporting. This year the charity is Halos of Hope, which provides handmade hats to cancer centers across America. You can read all about them and find out how you can join in on their mission here. 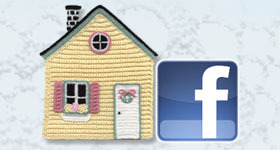 Another thing that Amy and Donna at Crochetville are doing during March (National Crochet Month) is daily giveaways. If you haven’t checked those out and entered to win, you can find out all about them here. All of the designers who are taking part for the whole month of March (National Crochet Month) are members of CGOA (the Crochet Guild of America). I’ve been a CGOA member for around 12 years now! Wow! Time really flies! To find out more about CGOA, check out their website here. I’m honored to have been the secretary on the CGOA Board of Directors since June, 2012, as well as co-chair of the CGOA Masters program. I’ll blog more about the CGOA Masters program on my CGOA Now blog post on March 27, as part of this Designer Blog Tour. So if you’d like some information about the Masters program, check out that blog post on March 27 here. I’m also working with Bobbie Matela from Red Heart/Coats & Clark this year to put together the CGOA Design Competition at the yearly conference in San Diego, CA this July! If you live anywhere near the west coast, this is your opportunity to attend an event that’s dedicated solely to the advancement of crochet! If you’ve never been to the CGOA Conference (aka: the Knit and Crochet Show), you don’t know what you’re missing! It’s so much fun! You can read all about it here. TKGA (The Knitting Guild Association) is the knitting part of this conference. There will be lots of knit and crochet classes to take, a show floor with lots of knit and crochet vendors (with yarns, hooks, needles, patterns, etc to buy), fun events, a Masters Day for both TKGA and CGOA and new fiber friends to make! I love attending the conference each year where I either teach classes or take them (I’m taking classes this year). I love to learn more crocheting and knitting, don’t you? The K&C Show’s class schedule was posted last week and registration should open within the next week, I think. If you’re attending the conference, make sure you register early to get the classes you want to take. Once they’re full, you’re out of luck and you may have to take an alternate class instead of your first choice! I hope you’re enjoying National Crochet Month and getting in lots of crochet time each day! I crochet year-round, so there aren’t too many days that go by without a crochet hook (or knitting needles) in my hands! I’ve been celebrating National Crochet Month by posting a photo and link to a FREE crochet pattern every day this month. Please check out my other blog posts to see the FREE patterns that you’ve missed! I hope you enjoy many of them and will keep watching my blog each day during the rest of March to get links to more FREE crochet patterns. In honor of National Crochet Month, I’m giving a 25% discount on all crochet patterns on my website, from today through March 31. So you have just over 2 weeks to purchase any Crochet Architect patterns that you want with this “special” National Crochet Month discount. The discount is only available on this website, not in my Ravelry, Craftsy or Etsy shops. To purchase your patterns with this discount, just input the discount code of “NatCroMo2015” when you check out. You can see all of my patterns here. I love lots of crochet techniques and one of my favorite techniques is Wiggly Crochet. It’s one of those crochet techniques that is so interesting and fun to do! If you’re a fan of Wiggly Crochet, like me, you’ll find many exclusive Wiggly Crochet patterns right here on my website. If you’re curious about Wiggly Crochet, check out my tutorial here and my blog post here with a link to a FREE Wiggly Crochet pattern! 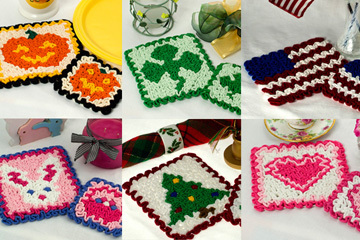 You can see all of the Wiggly Crochet patterns available on my website here. I hope you’ll enjoy the blog posts, tutorials and crochet patterns on my website. If you’d like to follow my blog, simply subscribe to my blog with your e-mail address. Your e-mail address will not be shared or sold. It will remain confidential, I promise! In my crochet designs, I strive to create classic designs that are pleasing to the eye, well-balanced and color-coordinated. I hope you enjoy them! If you ever have a question about one of my crochet patterns, please send me a message at the bottom of my “About Me” page and I’ll answer your question ASAP! I’ve been a crochet designer for over 15 years now. It’s been a blast doing what I love to do! I look forward to the next 15 years of designing and teaching crochet! This entry was posted in CGOA, Crochet technique, National Crochet Month and tagged CGOA, crochet techniques, National Crochet Month. Bookmark the permalink.